After my pity party last week, I ended up getting sick. Today is day FIVE of not being able to swallow without wincing in pain. I started antibiotics yesterday, but they're not really working yet. I decided it was best to stay home today so I can drool in peace calm my throat with all the Popsicles I want in my bed. Tomorrow, I'm scheduled to go to the zoo with our functional students... so I hope I'm feeling better by then! The nice thing about being home alone is that I get to catch up on blogging while watching The View. And lucky me, it's a Day of Hot Topics! My favorite! After sitting on the waiting list for MONTHS, I squealed with excitement to see The One and Only Ivan in my mailbox at work last week. I immediately abandoned my other books to read this one because after reading about it on your blogs for the past year, I knew I'd love it! I'm an animal lover. Well... I'm a mammal lover. Slimy, scaly things don't do it for me, but I've always been fascinated by apes. In fact, if I make it to the zoo tomorrow, I funny intend to spend most of my day in the ape habitats, whether or not J agrees. :) When I was really young, my favorite book was Koko's Kitten. Remember that one? Yeah... I taught myself the ASL alphabet because I wanted to sign like Koko. True story. In addition to being completely enthralled by all things ape, I'm one of those people who talks to my dogs like they understand what I'm saying. So, of course I loved that this story was narrated by a gorilla... because who wouldn't want to be inside a gorilla's head?! And a gorilla who thinks he's an artist? Be still my heart! 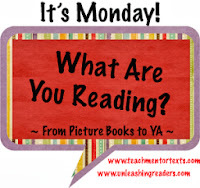 This story would be an easy read for most of my middle schoolers, but I think it would be a great pick for the reluctant readers. The short chapters and easy sentence structure take away a lot of the intimidation factor for those students. And they will certainly love all the characters in the book. In short, if you haven't yet read this book, you need to get yourself to your nearest library or bookstore STAT! Your heart will break into a million pieces and then melt like butter in the sun. You'll want nothing more than to become friends with the animals at Exit 8 Big Top Hotel and Video Arcade. You'll laugh with them, cry with them, and hope for them. 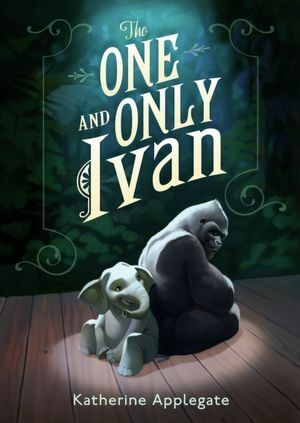 100% of students in my Children's Lit class this semester listed Ivan as their favorite book of the semester. 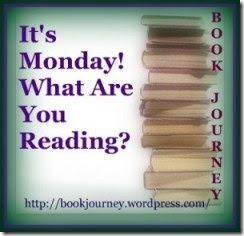 It was a great pick for those who don't love reading, too, for just the reasons you describe. Hope you feel better very soon and get to go on the zoo outing! LOVED it! It's in my top 10 reads so far this year. I have the book on hold. I hope you are felling better quickly. A zoo trip right after reading Ivan? How timely :-) However, take care of yourself today. If you're not substantially better, stay home. You owe it to yourself, the students, and the staff to allow yourself to heal. Wherever you spend your day, have a good one!